UPDATE: Read about Chen Guangcheng’s letter in support of the United Nations Convention on the Rights of People with Disabilities (CRPD). As a lawyer who has represented the blind community for the past seventeen years, I feel a particular affinity for the story of Chen Guangcheng, the blind Chinese lawyer and human rights activist whose bravery has captivated news audiences the world over. Chen is being recognized across the globe for his courageous human rights work and his movie-quality escape from house arrest. Is he capturing media attention in part because he is blind? Maybe. While under any definition Chen would be a hero worth celebrating, Chen’s blindness is certainly part of what makes his story so compelling. 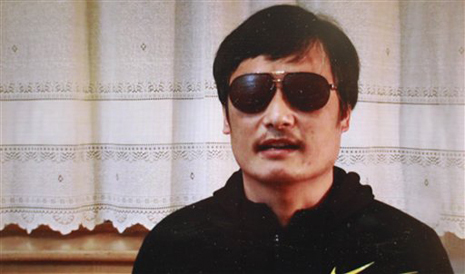 In China, most blind people do not receive an education, making the fact that Chen Guangcheng is a self-taught lawyer all the more impressive. Blindness is a stigma in China (as it is in much of the world), especially in rural areas where Chen is from. Preconceived and outdated notions about blindness limit opportunities for meaningful work, educational and social relationships. While the situation is slowly improving in urban areas, people with disabilities in China, including those who are blind, are shunned not just by the general public, but often even by their own families. And, as in many parts of the world, blind people in China are forced into a very limited number of occupations if they work at all. Massage therapy, unskilled manufacturing, fortune telling, or singing in the street for money are frequently the only opportunities for employment. Becoming a lawyer? Almost unheard of. And Chen spent four years in prison for his work in exposing the thousands of forced abortions and sterilization procedures performed on women by government population control officials. A true hero having nothing to do with blindness or sight. Blind advocates in the United States do not face the threat of prison, house arrest, or beatings for their beliefs, yet they work hard every day to make sure people with visual impairments are fully integrated into all aspects of American life. Many work on these issues on the international stage, as part of the World Blind Union and other international organizations. While Chen Guangcheng is not fighting for anything blindness specific, and is not specifically a blind person’s hero, admiration for Chen as a person and an advocate has not escaped the blind community in the United States. As a sighted lawyer who works with the blind community, I am humbled in the face of Chen’s commitment and courage. He has a vision for a just society that does not depend on sight, and is willing to risk his life for it. That is what makes him a hero. I feel it is inaccurate to describe Chen Guangcheng as a lawyer without qualification. People in the western world have an image of someone when they are described as a “lawyer” or “attorney.” This image is of someone who is credentialed by a school with a program that teaches legal theory or legal practice. All large countries, including China, have a system that licenses or certifies people to identify those who are qualified to practice law and represent clients. Chen was illiterate until age 23 when he enrolled at a school for the blind. Four years later, he began training in Chinese medicine. He specialized in massage and acupuncture. Bodywork is about the only career path open to nearly all blind people in Asia, including China. His family read legal text to him before he entered any school and he later audited law classes. Unlike in North America and Europe, Law schools are generally not open to blind people in China. Chen Guangcheng is a blind lawyer and human rights activist in China. Chen is a true hero regardless of his disability. Growing up blind in China is difficult. Most blind people cannot go to school.